Obituary of Russian-American anarchist historian Paul Avrich by Stuart Christie from The Guardian, Monday April 10, 2006. The common fate of anarchists, suggested Paul Avrich, who has died aged 74, was to be neglected or scorned. But what he wanted to do was to play a role in resurrecting them. So, as professor of history at Queens College and the graduate school at the City University of New York, he passed on to students an "affection and sense of solidarity with anarchists as people, rather than as militants". He also challenged the prevalent image of anarchists as violent and amoral. Russian Anarchists (1967) was followed by Kronstadt 1921 (1970) and in 1972, Russian Rebels: 1600-1800. He then moved into American anarchism with The Haymarket Tragedy (1984). This focused on the campaign for the eight-hour day in Chicago in 1886 during which seven policemen were killed by a bomb, and for which four innocent anarchists were executed - one cheated the gallows by killing himself, and another three served sentences until pardoned by the state governor. Sacco and Vanzetti: The Anarchist Background (1991) established that the two men, executed in 1927 in Massachusetts, were serious revolutionaries rather than "philosophical anarchists". In the early 1960s Avrich had taken advantage of liberalisation in the Soviet Union to research his dissertation on the Russian revolution and the factory committees there. The material he uncovered on the 1921 insurrection at the Russian naval base of Kronstadt - which was suppressed by the Bolsheviks and left more than 10,000 dead or wounded on both sides - was the basis for Kronstadt 1921 and much of his work on anarchists in the Russian revolution. Avrich's other work included The Modern School Movement: Anarchism and Education in the United States (1980) which dealt with the radical schools inspired by the ideas of the Spanish anarchist educationalist Francisco Ferrer i Guardia, which survived from 1910 to 1960. His last important work was the extraordinary Anarchist Voices: An Oral History of Anarchism in America (1995) based on interviews gathered over 30 years. 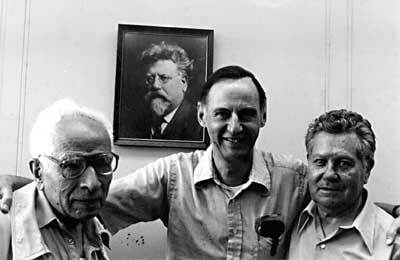 Avrich was nominated several times for the Pulitzer prize, and in 1984 he won won the Philip Taft Labor History award.